The rock garden takes up only a small area in our overall scheme - but it's one of my favorite areas. And since it straddles the front walkway, we all get to admire it up close every day. I can't call myself a rock garden afficionado - that would mean I'd know the ins and outs of alpine soil types, know how to place all the rocks for the most authentic look, and I'd feel comfortable throwing words like "scree" about. 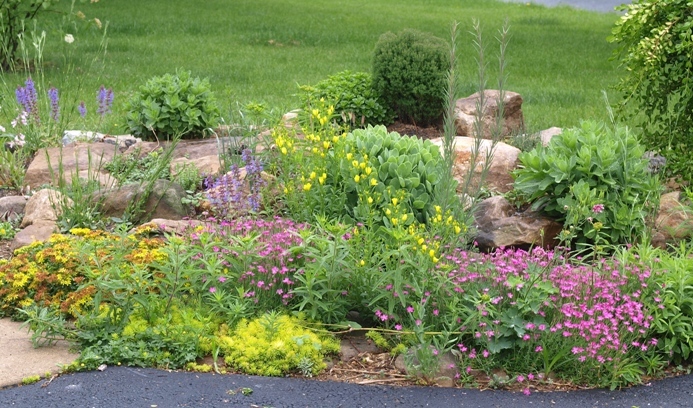 But I learned early on that a rock garden is the best way to showcase small perennials, especially those that require excellent drainage. And a few years ago I finally joined the North American Rock Garden Society (NARGS), so I guess that officially makes me a rock gardener. To provide for the needs of those small perennials, our rock gardens are somewhat elevated from yard level, and the native clay has been generously amended with sharp sand, granite grit, rocks dug up from other garden areas (there's a use for everything in our garden), and some compost. Our original rock garden was a strip between the driveway and the front walkway. It is badly in need of help at this point - the yucca we planted there originally gave up, but left lots of babies that come up all over, amid the tangle of various creeping or sprawling thugs, such as Kamtschat, blue-spruce and dragon's blood sedums, myrtle spurge, catmint, woolly thyme, and sea thrift. We now call this part the rock garden annex. The newer part of our rock garden, carved out of a corner of our front yard, was originally called the "front corner", but steadily morphed into a rock garden. It is now our main showcase for small alpine species. The photo above was taken a couple months after the most recent upgrade, with many of the plants coming into their own nicely. The blooming specimens include Dracocephalum nutans, Linum campanulatum, Sedum kamtschaticum, Coreopsis auriculata, and Penstemon hirsutus. The photo below shows the garden on the same day in late May, from the opposite direction. A problem with the rock garden is that I like it so much, I make it just a little bigger every year. That's fine with most types of garden - just cut away a foot width of grass, plant some low-growing perennials in the newly plantable area, and voila! But with a rock garden, it means rearranging the whole deal, to maintain a semblance of slope (I'm not pursuing the boulder field look) and natural rock placement. Ah well, it keeps me busy. Rock garden annex, early June 2015 with Scutellaria oreophila, catmint, butterfly weed, the short 'Marcus' variety of ornamental sage, hairy penstemon, and star of Persia all in bloom. Ellen Everett Mar 22, 2011 How do you control the weeds? When the plants stop blooming doesn't it look a little rough for about 5 months? My husband and I are in the process of designing a rock garden on a slope. Any other words of wisdom would be great. Thanks. martine mauger Jun 07, 2012 which one of the plants are ok in the shade? If I have knowledge of the sun and shade tolerance/requirements of plants, I've noted it on the individual plant portrait pages. Todd Aug 29, 2013 Hi, wehad drainage issues, so now we have created patio surrounded with 1-2" river rock with an underlayment of landscape fabric. One 6x4' section is an infiltraiton basin (pit) also filled with gravle and river rock. All water sheds either to the patio and ultimately the basin or directly to the basin. In most parts there is just a thin 1-2" layer of this river rock with underlayment and I wanted to augment it with sedum varieties and an occasional larger rock. My thoughts are to poke holes in fabric where to plant the sedum and then spread a little sand mixed with compost around it to let the plants spread. Does this make sense? Should I just dump sand on/in the rocks and plant directly into that? Thanks! Even sedum will appreciate a little more moisture than would be provided by just sand between rocks during a hot dry episode. So adding just a bit of loam or compost, and providing for a bit of a deeper root run might indeed be a good idea. But most sedums are pretty forgiving. 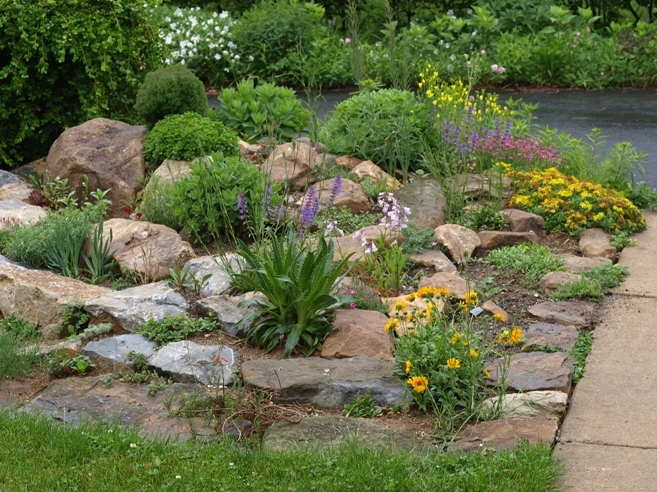 Eric Storath Jul 16, 2014 Your rock garden is beautiful. It looks almost like the area that we are planning. What are your area dimensions? Not particularly large – the rock garden is essentially a quarter circle wedge, with the straights defined by the sidewalk and the driveway. Sitting here in my basement, I estimate that the radius of the circle is about 6 ft – perhaps a little longer along the sidewalk edge.